FILE - Speaker of the House Paul Ryan (R-WI), right, walks to the House floor before a vote, on Capitol Hill in Washington, Feb. 9, 2018. The collapse of the U.S. Senate effort to find a legislative fix for millions of undocumented young people has thrown into question whether the U.S. Congress will be able to act at all on the contentious issue of immigration. The Senate voted down even the possibility of debate on four separate immigration reform proposals on Thursday, dashing hopes for reform after decades of division in Congress. Both Republicans and Democrats said President Donald Trump's criticism of a bi-partisan deal brokered at the last minute helped sink the measure. Meanwhile, a proposal modeled after Trump's four-point immigration plan emerged as the least popular, winning the votes of 39 senators. The failure to secure a pathway to citizenship for 1.8 million people eligible for DACA (Deferred Action on Childhood Arrivals) followed months of negotiations between Capitol Hill and the White House. With lawmakers out of session for the next ten days, time for securing a DACA fix is running out. Trump ended DACA benefits beginning March 5. While two courts have acted to extend the deadline, DACA beneficiaries could still be at risk of deportation unless Congress acts. 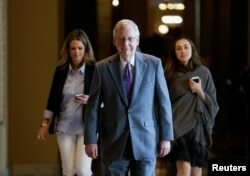 Senate Majority Leader Mitch McConnell (R-KY) walks to the Senate floor before a series of votes on immigration reform on Capitol Hill in Washington, U.S., Feb. 15, 2018. "I think it's safe to say it's been a disappointing week. I kept my commitment to set aside an entire week for a broad, productive debate over DACA," Senate Majority Leader Mitch McConnell said shortly after votes Thursday. "But once again, when the hour came to make law, instead of just making political points, our friends across the aisle were either unable or unwilling to get something done." McConnell's limitation on debate gives Congressional Republicans the upper-hand politically in a tough mid-term election year. "That really advantages Republicans who either don't want to provide relief for DACA recipients or only want to do so in conjunction with other immigration policy changes that Democrats are not willing to accept," Brookings Institution fellow Molly Reynolds told VOA. The move also benefits the White House, which said Thursday Senate Democrats failed to take immigration reform and homeland security seriously. "They filibustered a proposal with an extremely generous path to citizenship because it also contained reforms that secured our border and secured our immigration system," White House Press Secretary Sarah Huckabee Sanders said in a statement. "The Grassley bill was a compromise bill — as demonstrated by the fact that some conservatives opposed its very generous DACA provisions. Yet, the Schumer Democrats chose to filibuster it because they are held hostage by the radical left in their party, which opposes any immigration control at all." But the blame wasn't confined to one side of the aisle. 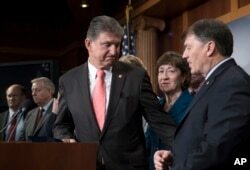 Sen. Joe Manchin, D-W.Va. (C), Sen. Susan Collins, R-Maine, and Sen. Mike Rounds, R-S.D., join others in their "common sense coalition" to discuss the bipartisan immigration deal they reached with other centrists this week that sought to offer citizenship to young "Dreamer" immigrants with President Donald Trump's demands for billions to build a border wall with Mexico, during a news conference at the Capitol in Washington, Feb. 15, 2018. Senate Democrats said the president's threat to veto the bipartisan deal made it too politically risky to back it. "There is no question the American people will blame President Trump and no one else for the failure to protect Dreamers," Senate Minority Leader Chuck Schumer said Thursday. In a last-minute plea to Trump, Republican Senator Lindsey Graham urged the White House to provide leadership on an issue that has proved impossible for past U.S. presidents. "Mr. President, listen to the American people and lead us in Congress and all will turn out well," Graham said Thursday. "If you turn this agenda over to the most extreme people on this issue, you're going to fail like Obama and Bush." The failed bipartisan plan would have provided a ten to twelve year pathway to citizenship for DACA-eligible immigrants along with $25 billion in funding for border security. Next step: the U.S. House? In the U.S. House, Speaker Ryan spent the week marshalling votes for a conservative immigration bill. Like the Grassley proposal that failed in the U.S. Senate, the Goodlatte bill is modeled on the four-point White House immigration plan. Speaker Ryan made a promise to House conservatives in January to help bring the bill to the floor in return for their votes on a funding bill to keep the U.S. government open. 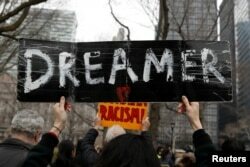 "It confronts the DACA issue. This is an issue that Barack Obama put on the door steps of America when he created DACA, a program that really had no path for anybody," said House Majority Whip Steve Scalise said Wednesday. "It just said — it encouraged a lot of people to come to our country and said 'somebody else is going to have to deal with it'. We're finally dealing with it. President Trump laid out the pillars of what he wants to see in a bill that can get to his desk that he can sign." But it faces limited chances of passing the House. "Ryan is trying to keep the right flank of his conference happy with the knowledge that this bill would be very unlikely to pass the Senate, even if it did pass the House," Reynolds said. House Democrats have argued for a strategy similar to the one employed in the Senate, where all proposals are brought up for a vote. "Put all the pieces of legislation, put the DREAM Act on the floor, put the Hurd-Agular Bill on the floor, put Goodlatte on the floor and I guarantee you — play queen of the hill. Which bill gets the most votes? It's not going to be the Goodlatte bill. It's going to be one of the bipartisan bills," said Rep. Linda Sanchez said Wednesday.